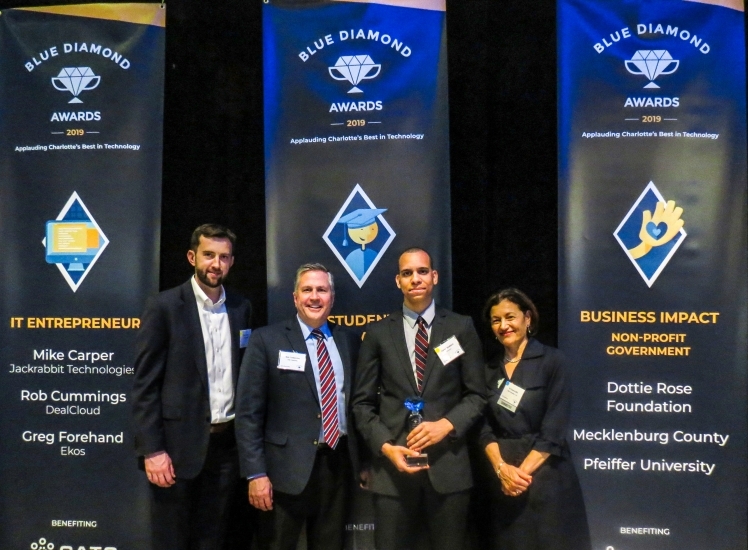 UNC Charlotte Senior Treven Stoddard was presented with the Student Innovator Award at this year’s Blue Diamond Awards, Charlotte’s annual premier technology awards celebration. Stoddard, majoring in Computer Science with a concentration in Mobile and Web Application, will be graduating in May 2019 from the College of Computing and Informatics. He began working on his innovation in Spring 2018 when he joined the Ventureprise Launch NSF I-Corps program. “I came up with the idea in my calculus class my freshman year. My T.A. had social anxiety and struggled with giving students additional assistance with math equations. After asking around, I realized many students were dropping out of STEM focused majors due to the frustration of algebra and calculus, Stoddard explains.” Stoddard designed Genubot, a problem-solving application for calculus and algebra students, focusing on not only providing the answer but also utilizing machine learning to determine specific concepts the student needs to focus on to learn the subject matter. While many other solutions concentrate on providing the user with only the answer, Genubot offers a different approach on learning by utilizing this new technology. Treven was nominated by Ventureprise Interim Executive Director Devin Collins and was presented the award by Dr. Fatma Mili, Dean of the College of Computing and Informatics. “We were excited to see Treven receive recognition for all of his hard work. He experienced a problem, conducted customer discovery with peers and then built a software solution. He’s a true entrepreneur, said Collins. Treven is currently going through the MIT Mentoring Program offered by Innovate Charlotte and will continue to work on his innovation this summer.